Marrying the precious scents of marine coral flowers with Australian mangrove wood and sweet white star jasmine, this Pacific Spa Candle provides you with the ultimate in relaxation after a tiring day by letting you recreate the indulgence of a spa day in your own home. 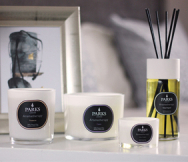 Carefully crafted by our experienced perfumers, the Pacific Spa luxury fragranced candle contains a blend of exotic scents, helping you to create a unique and distinctive ambience in your home. This exotic medley combines a variety of ingredients renowned for their calm-inducing properties, so you can rest a little easier as you sink into a world of fine fragrance. Coral flower is the first on the list of exotic notes poured into this luxury fragranced candle. This vibrant pink flower is found in the remote uplands of Southeast Asia and produces a rich floral fragrance that's distinctly oriental. Next comes jasmine, and together these two sweet fragrances combine to create wonderful naturalistic top notes that are both breezy and satisfying. In contrast to these sweet floral notes is Australian mangrove wood, a rare and exotic wood whose soft, warm balsamic fragrance provides the perfect base note to this flighty floral bouquet. Mangrove wood serves to refine and condition the scent for a round and satisfying fragrance that you'll love to experience in your home. Our Pacific Spa Candle is part of our Nature's Own collection, a series of scents that rely on the scents of nature to inspire truly unique fragrance additions. In this signature fragrance, we've aimed to capture the pleasure of a spa day, helping you to relax and unwind after even the busiest of days.